Now that the Awakened are free of Joko, it would be great to have an Awakened outfit which made the player look zombified. Perfect for Halloween but I’d buy it any season. Agreed, but please make it as an armour and not as an outfit! There is nothing on this list I find worthy of the development time it would take to make them happen. They are items you want, and are not necessarily indicative of the community's desires. Actually, most aren't even items he wants but stuff Arena Net, in keeping with their vaunted quality standards should have implemented in the first place. 1) I don't EVER use the witch's hat on human or Norn because it makes the character bald. 2) Most helms look incredibly bad on charr (including some cultural ones) because it exposes the charr's neck too much, hence looking like kitten. 3) We actualy have a couple of goggles that go onto the head instead of on your eyes, but they could "easily" give old goggles the same treatment as they gave the visor on the Luminous Heavy Warhelm Skin, having a up and a down skin. 4) When they released the Shining Blade Glider, this should have immediately entered the development radar, i bought it, and i kinda regretted it immediately, because while i could dye the glider to match my armour, i had to dye my armour and glider, to match the back piece version of the glider, it's poor quality and they know it. 7) He's true, especially post LS2, there's been a lot of helmets that amputate charr horns and char/asura ears. That's really poor quality work there. 8, 9, 11) They keep pumping out new hairstyles and hair dyes, and yet, with one or two exceptions those hairstyles are generally inferior to the free ones, and the colours are so neon-like that only people who want to make themselves look like xmas trees would pick. Most of his claims are reasonable, and are gripes that most players will encounter. I'm betting even the contrarians on the forums have had these gripes, but it's too hard to admit someone else's right. Sadly, the company aligned with these "we want moar new stauff, cause new sauff is good" mentality, and have ceased to work on old QoL and Quality improvement for the game. Guild Wars 2 used to be a game where these little quality of life increments were a huge factor into turning the game from good to great, but, sadly the way they're operating of late left no room for that quality, and the game has dearly suffered for it. 14 - Remove air breathers entirely. Air breathers are anyways just copies of our head gear, they can't be much other for many reasons. In any case, if you like to improve underwater performance, you need to have separate underwater gear & build set for your toon, because of the limited number of weapons you can use. So remove that annoying little head piece entirely, or replace it with full underwater gear & trait set. It wouldn't hurt that you would also get rid from underwater weapons, too, and tailor regular weapon set skills for underwater combat: if this is not possible, at least give us some more options for underwater weapon skills so that we could choose the weapon based on our armor + trinket stats (that is, power or condi dmg and so on). If that is not possible, at least give us invisible airbreather skin (for all weights), or add a checkbox to airbreather to turn it invisible like helmet. Remove item stats flat out. No replacements. Skills simply do what is said in the tooltip, and that gets balanced. We'd still have oodles of character customization via traits / skills / weapons / runes / sigils. Speaking of runes, with the stats removed collapse the number of runes significantly, going for actually interesting bonuses. Make some class-exclusive to facilitate stronger interactions. Change underwater breathers to use a special type of rune which - as usual - breaks your 6-set bonus for a new, underwater centric, effect. Reduce elite spec power to the overall power of the main specs. Make them actual sidegrades. Collapse many traits, no more unneeded choices just to power up the same thing with 6 traits. 1. Hoods/ Hats/ Outfits that make characters bald. Stop. Doing. This. Anet. Helmets/ Armors that expose the neck Area. Goggles. The goggles we do have side on our characters face, great! Now, can we get some that sit atop out characters heads? Without removing our hairstyles? STOP ignoring Charr Horns & Ears and Stop ignoring Asuran Ears. There is a Nature's something outfit. Long, Nice looking Hairstyles for all humanoid Races. No More Anime Hairstyles for Charr. Oh, yes! So much this! The one mustache we have is so badly designed, it consists of two layers, which makes it look ultra fake. The reason most of my characters hide the head slot. I don't even bother trying to skin headpieces anymore, except the heavy helms that cover the whole head. Here's your problem: I don't need anything of this. I do not need housing, and I don't need a kitten of hair styles (there are a lot anyway). You may be right with more long hair styles though. A lot of people think it is fine as it is. There are to me a lot more stressing points I want. Mainly quality of life features like additional side bars for food and utility, a fully customisable UI. Those things. They mean one that looks like Avatar of Melandru from GW1, since the other Human God outfits look like the respective Dervish Avatars. It would be nice if we can get armour for male characters, where they show some skin. We have a few coats, but for example not so many trousers, especially the light armour section. Can we get some short leggins or kind of a robe, like the trousers of the elementalist outfit? 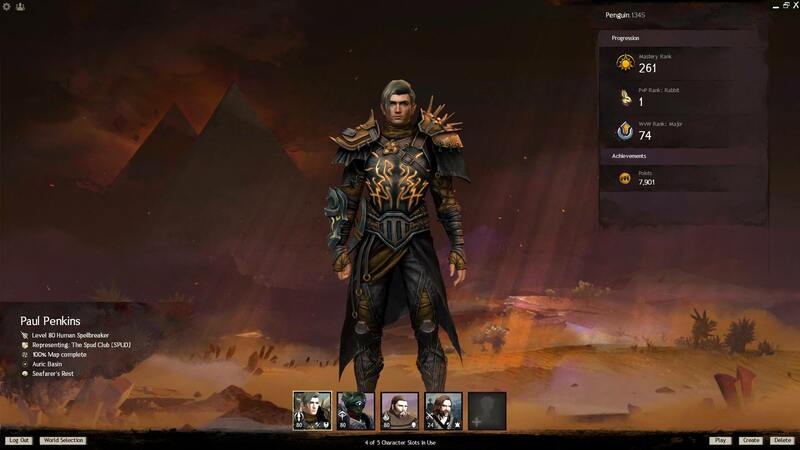 You have the endless awakened archer tonic available in Istan for 245000 karma and 250 kralkatite ore. It's a combat tonic you can add to your novelties. Just less practical than outfit for mounts but it works well in combat ! I would suggest looking at the Quality of Life thread for your suggestions. This is now stuck to the main page, but you can find a bunch of others posted throughout the forum using the search, which now works btw. I would love to see a new type of item added to the gemstore -> Custom Revive Animations. We already have finishers, which make WvW more fun. But for us PvE players who enjoy group content and often have to pick eachother up, something like that would be cool to see. Maybe your friend died and you're giving them a CPR. Or maybe you summon a bunch of small quaggans who shake your friend awake. There are many possibilities with this and personally I wouldn't mind purchasing some new cool resurrection animations. What about a Stat tracker for gem store. Track total damage lifetime. Last 5 seconds last hour etc. other interesting stats. Some outfits has the gloves as a toggle. I however would absolutely love a toggle for the shoulders on Rox's Pathfinder outfit. Especially the male version on which the massive shoulderguards ruin the tracker/stealth/scout look. Not to mention, they arent even attached! They just float there and make ugly. however its a bit sad that while we can dye the glider any color, the backpack is just black, i would suggest atleast a white and brown versions for the future too, just like the feathered wings. Hi I do not post on the Guild Wars 2 official forums at all, but my first post will be a suggestion for the gem store. I understand the black lion statuette was included in the black lion chest for sometime as anti-gambling measure. My idea is adding the permanent items contracts to the black lion statuettes as way to reduce the gambling aspects somewhat. First this can be done by making the statuette version of contracts account bound so prices remain stable on the BLTP. Secondly once a player binds the endless version to their accounts they can trade the single use version for statuettes and gain statuettes from extra BLC drops. Third the contracts could be price at 250-300 statuettes as that is reasonable price for something that valuable and useful. This is just a suggestion and I hope I am not asking for too much. I understand arena net needs money to keep creating content for this wonderful game, but sometimes RNG in this game can problematic at times. Sorry for the wall of text I just needed to air out my thoughts. Scale Dragon Mount skin for Griffon. Scale Dragon themed weapon set. Question. Is the spooky mount pack in the gem store actual mounts ? Or just skins of mounts you already have in your inventory ? I don't have the flying Griffin currently. Take the Bat wing glider. Turn it completely BLACK. Add tatters and holes you can see through the skin of the bat wing. Thanks for the Scaled Dragon backpack/glider combo! It's basically what I wanted (black bat-like wings). I hope the backpack looks good with the Black Poly-luminescent Undulating Infusion. Will check it out once I'm home from work. Extra suggestion: an endless tonic version for the strawberry ghost effect. It would be nice to put in the novelty tab and with a 100% chance rate. Maybe a recipe that requires a lot of strawberry ghosts to make? What we need for Halloween is a pumpkin mount skin for the Roller Beetle. Charr Chugger (from Norn Personal story) as a mount skin. Also, please make all clothing tonics available as outfits. I think they already are. Check the Black Lion Exchange vendor at the Bank in major cities. Right now they are almost all also available for purchase with black lion statues. I often find myself loading through 1 or more towns just to reduce the cost of using waypoints. This can get kind of annoying when I have to travel a lot in a short time frame. And for players with slow loading times, it can get infuriating. How about a gem store item that lets players portal to any waypoint for only the base WP cost, regardless of distance? Even if it costs like 1,000 gems and takes years to pay off, just the convenience of not needing to go through multiple loading screens would be great. This is especially true for players with slow loading times. Would love to see the Sworn Zaishen Helm Skin either through gem-store or the Black Lion Statuette hopefully for the Halloween update this next Tuesday. How about custom outfits where I can select 6 pieces of armor - with or without rings and automatically equip them on and off. I would love to see the Magitech Medium Armor Skin back on the gemstore. I need some of the pieces to make a cool new look for my Engineer, but I haven't seen it on the gemstore in a while. Please bring it back soon! I would love for you to do matching beetle skins for some of your "full" sets. I've been waiting forever, hoping for an exosuit beetle so I can complete my collection and have all my mounts in the same style. Branded beetle, skeleton paint beetle...I think you catch my drift. It would be a super bonus if on release of the new matching beetle skins you gave a free copy to those who purchased the "full mount pack" of skins before there was a beetle...but I would still buy gems (with real money) for a matching exosuit beetle skin. hmm I'd love to see rampart / strider's / incarnate armor skins return! I am utterly in love with the PoF music boxes, but I am NEVER going to get them... can you offer them in the gem store? Please?